It is that time of the year again: the shopping, the presents, the delicious food and of course the decorations in the form of traditional Christmas lights! If you are looking for easy ways to hang Christmas lights around your home, you have come to the right place. We will tell you exactly how! Draw an outline of your house and identify the areas you want to hang the lights on. 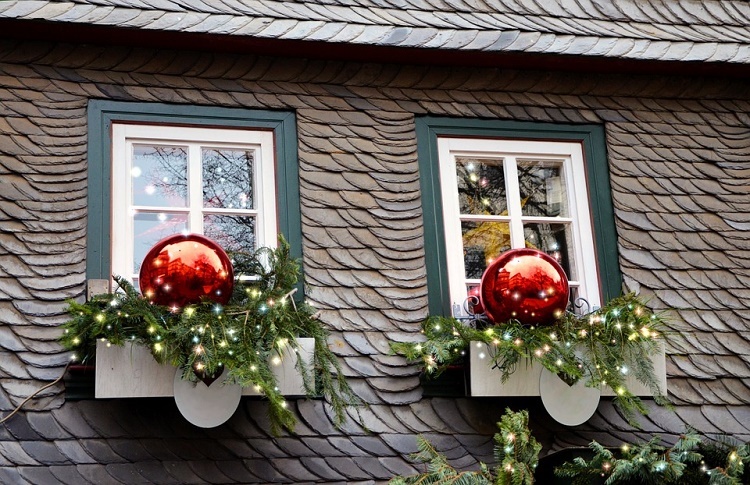 This is the first step to help you get started with your Christmas decorations. When looking to hang Christmas lights around the windows, take measurements of all the windows around which you will be hanging the lights. This will help you know the length of light strings to buy. Do not forget to measure the distance to the power source as the last thing you’d want is a beautiful light display that does not reach the power source. Most Americans buy red, green, yellow and white lights for Christmas. If you want your lights to be really bright, then you need to stagger two strings of lights side by side. Alternatively, you may invest in readymade light strings with bulbs that are closely grouped together. Closer the lights, brighter they will appear. Also, when buying the lights, check the color first. Many lights appear white when unlit, but give off a bluish tinge when lit up. Also check all the light strings side by side to ensure that their colors and brightness levels match well together. For a cleaner look, use white strands on the trims of the house and green strands on trees and bushes. Icicle lights look great on gutters. There are tons of different color options to group together. Just make sure you use similar color wires together for the best results. If you are reusing last years’ lights, do test them on the ground first and not when you are up the ladder-this is important to save efforts. You can also buy timer lights to save energy. Forget the methods you have been using all these years for attaching lights. This year, you will not want to use nails and strings to attach Christmas lights. Instead, go for convenient light clips which are available in different shapes and sizes and are fit for all surfaces. Go ahead and attach the light clips to the wires. Make sure the lights are all running in the same direction. Light deck clips can easily roll around railings to hang the lights without causing any damage. Light clips can really give you a cleaner, straighter and neater look. Start at the bottom and wrap the light strands around the trunk in even increments. Branch out as needed and wrap a strand around each branch. Double up the light strands on your way back. Use about 100 lights per foot of the tree. You can use cable ties or light clips mentioned above to hold the lights in place. Use a step ladder for this job and always practice basic safety measures. Take help of a friend or family member when attaching gutter lights. This way your partner can feed you the strand of lights as you work to make the process easier. Use smaller all purpose light clips which can be easily connected to the bulb or the light strands. You can also use tracks for rope lighting. These are plastic tracks in which the rope squeezes into. Attach the track in position first with glue or nails and then press the rope into the tracks. Tracks can be left on the house all year round and they won’t be visible. Tracks are the subtlest and easiest way to hang straight rope Christmas lights. Go for projection lights. Light projectors come in various shapes and sizes and some even play music and animated movies. All you need to do is plug them into an extension cord after spiking the light into the ground. This way you can avoid all the steps given above and forego the string lights you have been using year after year. Projection lights are cost effective and can be set up in literally 10 minutes. You can go for the slightly more expensive and fancier projection lights having the swiveling feature. Some even come with lasers and other with LEDs. Never hang the lights when the conditions are poor. Do invest in a sturdy ladder with adjustable feet and good traction. You can also hang the brighter bulbs on the inside of the windows. While it may not give the same effect, it will be much safer than hanging the lights when it is icy outside. Hanging Christmas lights is a tradition that can make the dark winter days look a little more cheerful.We hope the above easy ways to hang Christmas lights help you.